In 1933, Dhyan Chand's Punjab regiment was playing a match in Rawalpindi (now in Pakistan). The opposing team's centre-half lost his cool and hurt Dhyan Chand's nose. The game was stopped. After receiving first aid, Dhyan Chand returned to the field with his nose wrapped in a bandage. He went to the centre-half and said, "Play carefully so that no one gets hurt." Dhyan Chand then went on to score 6 straight goals. hyan Chand returned to his barracks in the Punjab Regiment after the 1928 Olympic Games. There was no peace for him as his army colleagues used to come and listen to his Olympic tales. Emblazoned in gold on Dhyan Chand's jersey was his name. He owned the centre-forward position from now on. Though India did have other outstanding centre-forwards, none could match Dhyan Chand's game. For 5 years in a row from 1931, Dhyan Chand helped his 14th Punjab Regiment win the Punjab Native hockey tournament. Due to his fame, opposing players used to specially target him. In 1933, Dhyan Chand's Punjab regiment was playing a match in Rawalpindi (now in Pakistan). With Dhyan Chand giving yet another display of his mastery in hockey, the opposing team's centre-half lost his cool and hurt Dhyan Chand's nose. The game was stopped. After receiving first aid, Dhyan Chand returned to the field with his nose wrapped in a bandage. He went to the centre-half who had injured him and said, "Play carefully so that no one gets hurt." Dhyan Chand then went on to score 6 straight goals. There have been many stories on how Dhyan Chand's stick was changed to see if he would still score goals. One such incident happened when he was playing in an army tournament in India. 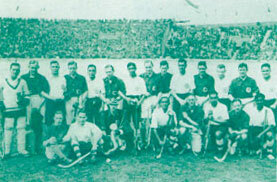 During the interval, Dhyan Chand was talking to a British player of the opposing team. The British officer's wife exchanged Dhyan Chand's stick with her husband's without their knowledge. As usual, Dhyan Chand scored goals in the second half too. It was like changing the bat of Don Bradman and expecting that he would not score many runs because of the new bat!